Most people get so conscious about getting older. They worry about the handicaps that come with it when they increase in the number of age. When you reached the so-called “Golden Years”, your body weakens; systems such as sight and hearing become poor; energy becomes limited and memory processing becomes slow. It’s a whole new stage of life where we are not as energetic and active as we were back in our younger years. Nevertheless, why focus on the negatives and not on the positive side of growing old? Age brings aptitude, experience, understanding, and beauty, so why are we so scared of growing old? Check out this article about the Benefits for Senior Citizens and this might change your perception towards the said matter. Recognizing the importance of the elders, the Philippine Government has provided those exclusive services, support, and benefits. Rappler has recently shared the updated list of offered benefits for Senior Citizens in the Philippines. If you are an elder or your parents are senior citizens, read up so you will be aware of what’s good for you or for your parents. Hotels, Restaurants, Theaters, Cinemas, Concert Halls, Circuses, Leisure, and Amusement. In addition to the things mentioned above is the 5% discount on utility concerning the monthly use of water and electricity. This is only applicable if the meter is registered under their name and consumption should not exceed beyond 100 kWh and 30 m3. Senior Citizens are excused or exempted from paying individual income tax if they are minimum wage earners. Moreover, they are also pardoned from paying training fees for socio-economic programs promoted by private and government as agencies such DTI, DOLE, DA, TESDA, and DOST-TRC. For indigent senior citizens, a social pension is given to them. They may receive a monthly income of P500.00. In addition, all senior citizens are automatically covered by PhilHealth’s National Health Insurance Program shouldered by the Government. In terms of economic and disaster concerns, senior citizens are to be assisted through dissemination of food, medicines, financial aid and house reparation for safety purposes. Naturally, senior citizens are given extra privilege in express lanes in all private, banking, commercial and government establishments. Elders who wish to pursue education may also avail scholarship grants, financial aids, subsidies and other similar incentives. Same privileges and benefits shall be given to them from GSIS, SSS and PAG-IBIG as enjoyed by those who are in active service. May katanungan lng po regarding sa binibigay na tulong para sa mga senior citizen na 500/month.Isa po ang nanay ko sa nakakatanggap ng monthly income na 500.Dito po sa Municipality namin hnd monthly natatanggap ng nanay ko kundi quarterly. 1st & 2nd quarter may natanggap sya.para sa 3rd quarter wala po kc ang advice daw sa kanila ay pipili lang ng tao na makakatanggap.isa po ang nanay ko sa hindi napili.talagang ganun po ba ang patakaran?Kailangan na mamili sila ng pgbibigyan ng tulong?Ano po yun patikim lang?Isa pa po ang nakasaad sa Memorandum eh monthly..bakit naging quarterly?D2 po kami sa Municipality ng Camalig,Province of Albay.Salamat. 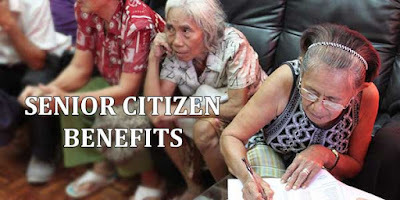 The Department of Social Welfare and Development (DSWD) has a Social Pension Program for Indigent Senior Citizens (SPISC) that gives P1,500 to poor senior citizens every quarter (P500 monthly). Indigent senior citizens are those who are frail, sickly or with disability; do not receive pension from state-run pension agencies; and do not have a permanent source of income or financial support from family or relatives.